While experienced art consultants have the ability to provide aesthetically pleasing artwork consisting of pretty, local pictures, the insight into whether this aesthetic is appropriate for healthcare populations is often missing. Given the evidence on the therapeutic effect of using appropriate art (discussed above), this could be a critical oversight. Yet another aspect of evidence that is relevant, in addition to the therapeutic benefit of art, relates to how presence and quality of art can effect patient/visitor perception of the quality of care at the hospital, act as a de-stressor for staff, have an impact on the branding of the hospital, serve as a point of focus and discussion for visitors, and of course, add to the overall appeal of the visual environment (these themes are emergent from a 2007 post-occupancy evaluation of the art program at MD Anderson Cancer Center, Houston). 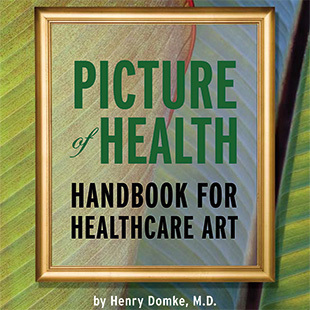 Artwork is often the most visible and noticeable aspect of the visual environment and this increases its potential impact on patients/ staff/ visitors, and in the final analysis, the economic bottom-line at the hospital. Figurative Art (depicting emotionally positive faces, diverse and leisurely in nature). Kathy Hathorn is the CEO of American Art Resources. Upali Nanda PhD is Vice President and Director of Research at American Art Resources. American Art Resources is the largest art consulting firm in the United States working exclusively with the healthcare industry. It is one of only two Art Consulting firm conducting original research on Evidence-based Design. The other firm is Aesthetics based in San Diego. I am intrigued by how images of art in a health care center can help and impact healing for people. I have also had a lot of personal experience in drawing my way through difficult health care moments, or moment of pain and physical challenge. I notice that by drawing through these moments, by being in the moment through drawing unusual answers emerge, pain is lessened and one finds a kind of calm solace and clarity, not found before. Wow, the more I read about this the more excited I get as an artist. This visual-type therapy has been on my mind for about 3 months–then to find all this information (and research)is wonderful “I’m eating it up”! The concept of evidence based art for healthcare environments is a giant step in the healing process. Medicine, too often is geared to treating symptoms rather than illness. Evidence based art has been shown to help people heal. It addresses the illness rather than drug treating the symptoms.